The Tenkara no Oni Type I has long been my favorite tenkara rod. It’s incredibly light in the hand and has an action that suits my casting style perfectly. 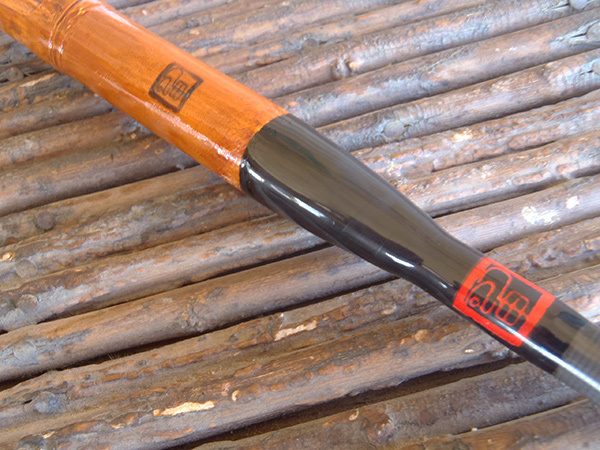 I’ve been fishing the original model with the straight foam handle (not the current models) for a couple of years now, but ever since I heard Masami Sakakibara made one with a bamboo handle, I’ve wanted (OK, lusted after) one. Masami-san hand carves each handle himself, and because finding the right-sized bamboo is difficult, they’re produced in small batches–only 2 or 3 at a time. The handles are finished off and lacquered to a beautiful caramel color that make the Type I instantly recognizable on the stream. The timing finally worked out where I had a little play money and there happened to be some in stock, so I finally got one. 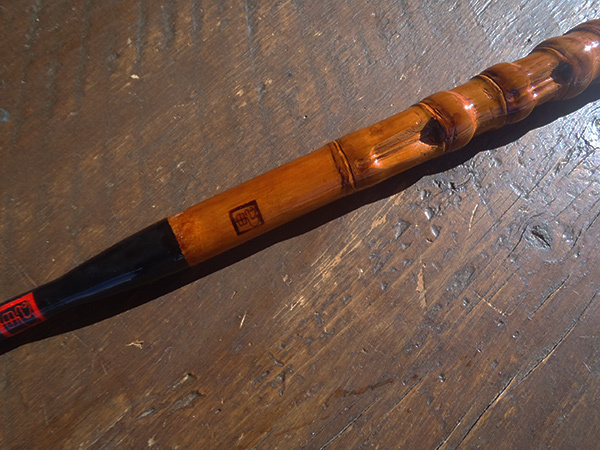 One thing I didn’t know about the bamboo handle (and you may not know) is that it isn’t just a plain round grip. From pictures, it’s easy to see that there are indentations kind of like the ones on the steering wheels of older cars. But what I’ve never noticed (and no one’s even told me) is that the ergonomics are a lot more sophisticated than that. 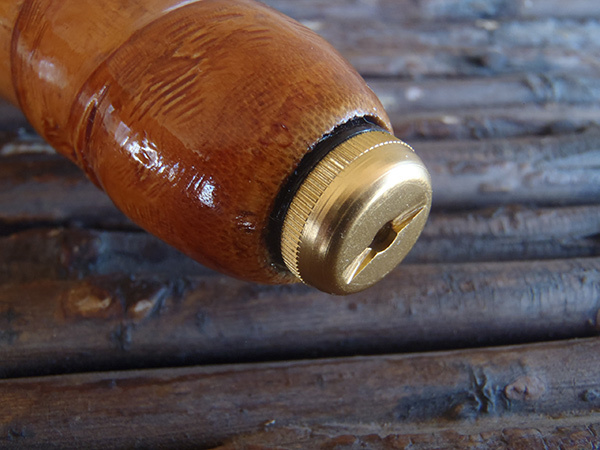 There are actually several other notches carved into the handle in strategic places to more comfortably hold the rod in different positions. Right below the winding check, there is a long groove for your finger tip and further down on the opposite side of the rod is a notch for your middle finger. These are used for when you want to choke up on the rod. There are also several other configurations to hold the rod in different ways. For example, there is a similar one for gripping the rod mid-handle. When I discovered this clever design, I have to admit, I couldn’t believe I hadn’t heard about it before. Beyond mere aesthetics, it seems to me that someone would have mentioned the superior ergonomics of this handle. Of course it’s entirely possibly someone has and I just missed it. One other small design element I wanted to point out is the end cap. 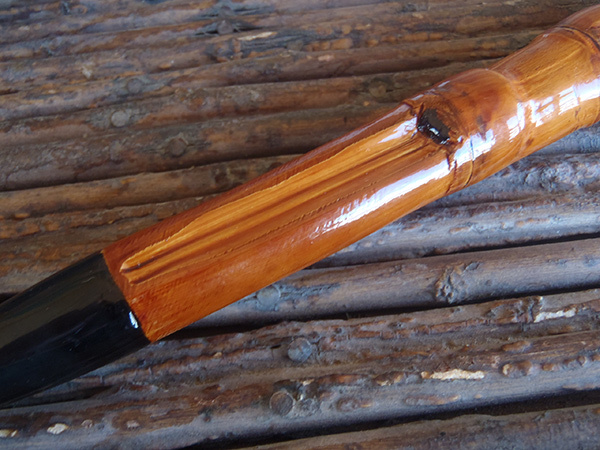 Typically, tenkara rods either have a knurled cap or one with a coin slot. The Oni bamboo Type I has both. So it’s easy to remove in the field, but if it’s too tight, you can unlock it with a coin, the back of a knife, or other flat object. Some people don’t like metal end caps because they’re cold when you grip the rod at the very end but if it’s cold enough for that to be a problem, I’m usually wearing gloves so it’s not an issue for me. This rod comes with a cloth sack identical to the ones shipped with the current production foam-handled rods. 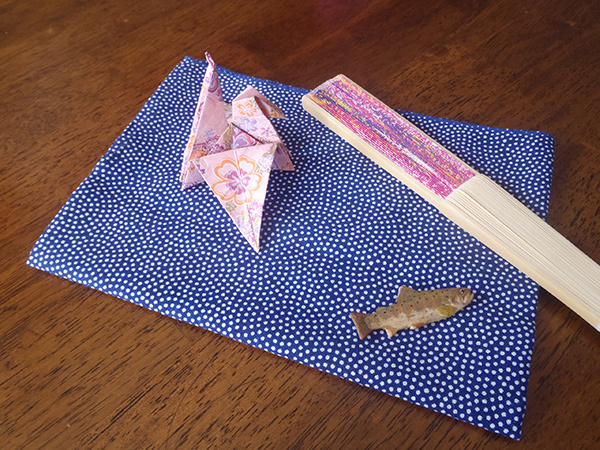 Being the generous person he is, Masami-san was nice enough to also send along a few surprises including a fishing towel, Japanese fan, a trout pin, and even an Origami swan! This rod is an anachronistic gem–a nod to tradition with gorgeous aesthetics, clever ergonomics, and a high-tech taper design. I will cherish every second on the stream I get with it. 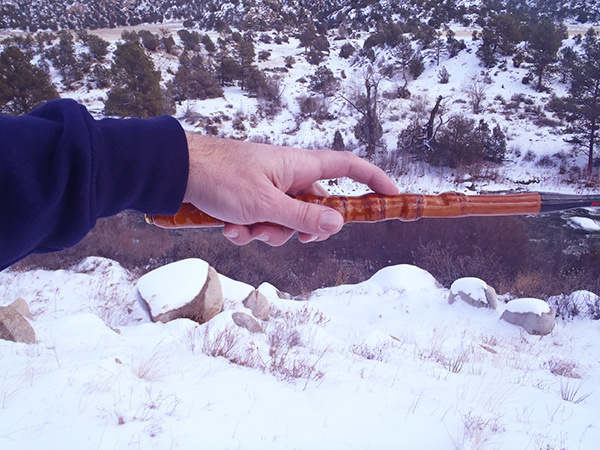 The rod Oni made for me fit my hand so well I can hold it for hours without feeling the need to alter my grip. It is a true extension of my arm. I’ve had mine about a year now, ever since your first ‘purple cow’ post brought it to my attention. I’ve found places where my hand just naturally fits based on the knurls and indentations along the bamboo grip, but I hadn’t realized those were intentional. I assumed the reason they are produced in such limited number is because he has to go through a bunch of potential handles to find the ones that are destined to become part of his rods, so thanks for enlightening me. Mine came in a dragon print sock (at that time I was given the option to select between one of three different prints) and a hand-written note on paper that was then folded into itself origami style to make an envelope that contained two or three flies and a pink size 4 level line, so the little gifts change up a bit – I think that’s a nice touch and makes it even more personal than it already is. Can’t wait to hear how you like it, Jason, especially since you have lots of experience with the foam-handled version with which to compare! 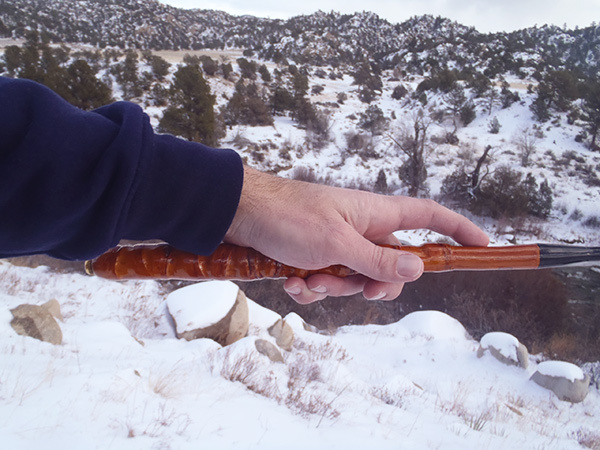 It was split cane like a regular fly rod. The action was great but it was very tip heavy. 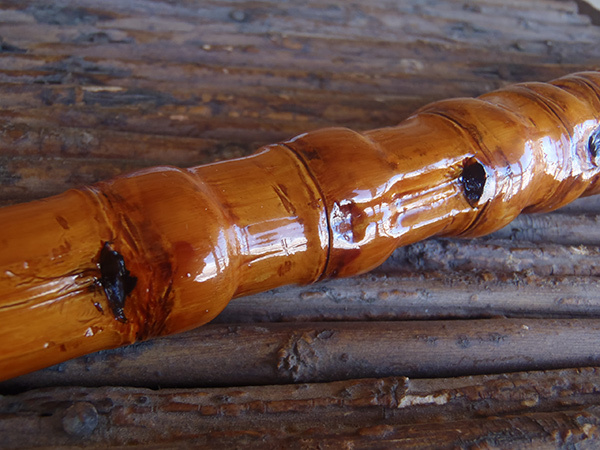 To do a bamboo tenkara rod right, I think you need to do round and hollow like they used to which is kind of difficult to build and pretty expensive. 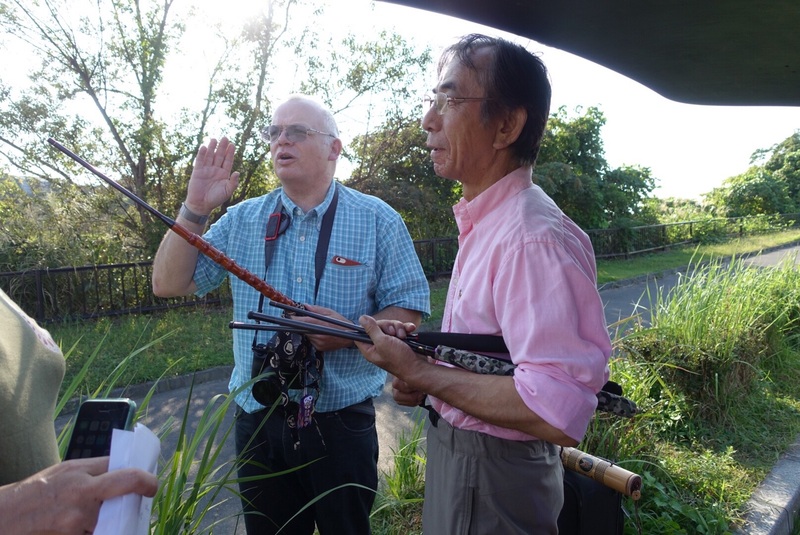 There are some telescopic bamboo tenkara rods out there but they’re more than I’m willing to pay. As for fiberglass, aside from the added weight (which is significant for me), I’m not sure I see much of an advantage. Even high modulus graphite tenkara rods are relatively soft compared to their western counterparts and have a similar feel to fiberglass in my opinion. Great article, Jason. 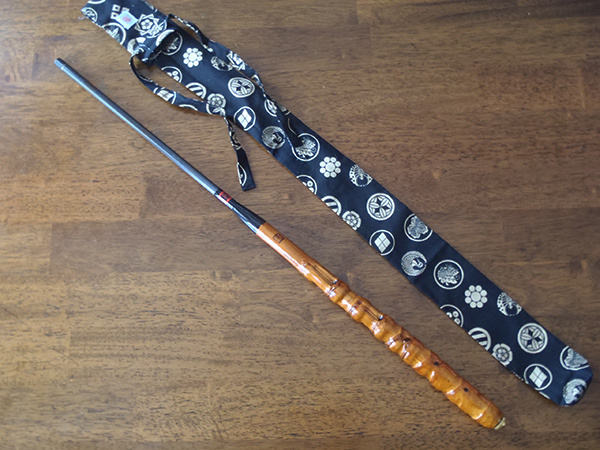 I also have a bamboo handle Oni Rod, inspired by the picture in your Purple Cow article. I was living in Japan when I got it and was able to pick it up from Masami himself. I asked him where he finds the bamboo, and he said that most of it is found on walks with his wife through the forests around his house. Adds even another level to the small batch artisanship and personalization that goes into these rods. I will never go back to a regular handle. Hey Tim, wow, I didn’t know that he gathers the bamboo himself too. Thanks for sharing. You’re right. That does make it even more special. So-o-o-o-o-o, have you had a chance to fish this rod yet? If so, what’s the verdict as compared to the standard Type I ? Hi Jim, yes, I have. As predicted, it fishes the same as my foam-handled version, though I do notice a very slight difference in weight in the hand. It’s not tip heavy or anything. 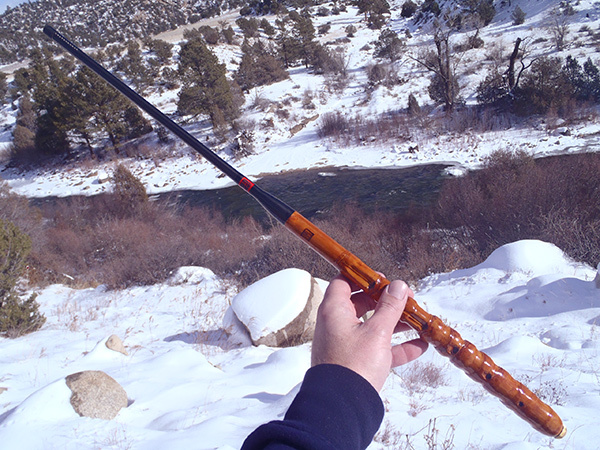 But if you hold the two side by side, the bamboo handle rod does seem a little heavier. I’m not sure if that’s a false perception or not and I didn’t really notice it while actually fishing so it’s not a concern for me. The ergonomics well compensate for any small perceived or actual weight difference. Part of me still prefers the foam but the bamboo handle fits my hand like a glove so it’s tough to decide which one to take. Very, Very nice! Glad to see the review.